Newly renovated with a coastal feel;;;; 7 bedrooms, 7.5 baths, 3rd row wonder on Capri Lane in trendy North Forest Beach! Need a spot to host a reunion? How about a relaxing, re-energized home to host your office retreat? A getaway with the girls or a golf excursion with the boys? Or maybe just a summer vacation with your family? 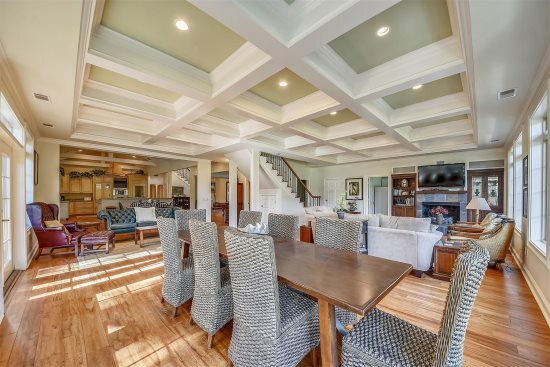 The vacation of your dreams awaits at this luxurious, newly renovated (2018), 7 bedrooms, 7.5 baths, 3rd row wonder: 2 Capri Lane in trendy North Forest Beach on Hilton Head Island. 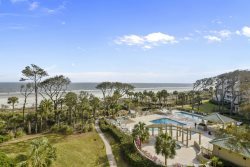 Offering glimpses of the ocean, a raised pool and spa deck, spacious interiors for everyone to lounge, contemporary, coastal furnishings, and if that isn’t enough, it is also just a quick hop and skip to Coligny; a true vacation haven. The raised style of the home allows for garage parking for up to 6 cars at ground level, as well as, a glimpse of the ocean from both the house and the raised pool and spa deck. To the left of the 2-story entry foyer is an idyllic great room with an inviting 3- piece seating group, soliciting your attention to the mounted flat screen TV, located above the impressive fireplace mantle. A wall of windows provides views of palmetto trees and a glimpse of the ocean just beyond that. A state-of-the-art gourmet kitchen defined by a spacious island with a sink, dishwasher, wine cooler, and 6 wicker bar chairs sits along the back wall of the living room. For added comfort, the ornate kitchen also features a sub-zero refrigerator, double wall ovens, a gas cook-top stove, a walk-in pantry, and frosted glass cabinetry. Everyone can gather together at the banquet size, wooden, dining table occupying the center of the room and complete with 12 plush chairs. The room's outside wall includes 2 sets of sliding doors that lead out to the relaxing pool deck, home to a chic, wicker table with matching chairs, perfect for dining al fresco. Lounge in the pool to stay cool, lay on the deck and soak up the sun, and utilize for your evening barbecues. A short hallway off the great room has a convenient powder room, and the first of 7 bedrooms. This room features a queen-sized bed, TV, large closet, and private shower/bath. The hallway ends at the very private master bedroom, which features a king-size bed, an armoire with TV/DVD, a walk-in closet, a large window wall with a slider door to the pool deck, and a private bath with a spa tub, a large walk-in shower, double vanities, and a separate water closet. Off of the entry foyer, a second hallway leads to a laundry room, a corner bedroom with a king-size bed, large double closets, and a spacious private bath with a walk-in shower, and a charming nautical themed bedroom with 2 twin beds, a TV, and a private bath. A grand stairway leads to the 2nd floor where there are 3 more bedrooms, a hall bath, a 2nd laundry room, and a spacious family room, which is brightened by windows on 3 sides and features comfortable seating, a TV/DVD, a game table, a wet bar with small refrigerator and coffee maker, and a slider door to a deck overlooking the pool. The fifth bedroom is a second master suite with a king-size bed, a TV, a walk-in closet, a slider door to the deck, and a private bath with a spa tub and walk-in shower. Bedroom #6 has 2 twin beds, a TV, and a private bath, and bedroom #7 has a queen-size bed, a TV, a slider door to the deck, and a private half-bath with a connecting door to a shared shower with the hall bath. The pool and or outdoor spa can be heated together or separately for additional charges. Pool can be heated from September to April. Staff was professional and polite. We loved 2 Capri. 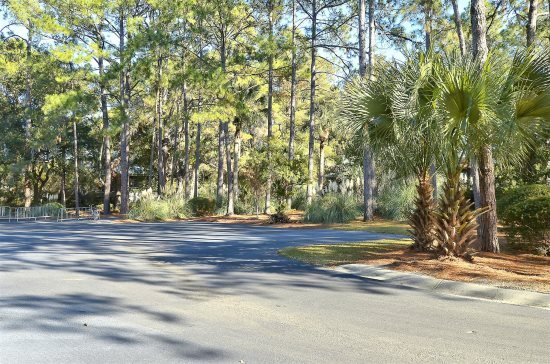 House has a great location, easily walkable to beach, and also is a very flat walk. The pool at the house is excellent, I especially like how the pool was at the same level of the kitchen. Wonderful time. This is one of the best properties we have stayed in over our 30_ years of coming to Hilton Head. Service was outstanding and all of the staff was courteous and helpful. Response time for questions and resolution to any problems was fast and courteous. We loved working with Sunset Rentals. Best service we have ever received in over 30 years of coming to Hilton Head! A wonderful house with a fantastic pool and a very short trip to the beach. We have been staying in your properties for probably 7 years now. Your staff is always very attentive to the little things that need attention, and we enjoy your properties very much. Thank you, and see you next year. 2 Capri is great. It has terrific amenities and a great location. Bedrooms are spacious and the Great Room/Kitchen is first rate. Pool has to be one of the larger on the island. In all, a terrific vacation experience.